Saint-Emilion, France. You can almost taste the goodness of this area as it swirls around the tongue like a good wine. This wine region is renowned for delectable flavours, and a deliciously vintage feeling that seeps from its historic heart. But before I regale you with my experiences of this corner of France, I have something to confess. Something rather embarrassing. This was not only my first time in Saint-Emilion, but it was also my first foray in France. Our paths just never seemed destined to cross, even though I had developed something of a love affair with France from afar. My wanderlust daydreams starred leisurely walks along the Seine, gallery hopping and revelling in the café culture of Paris. 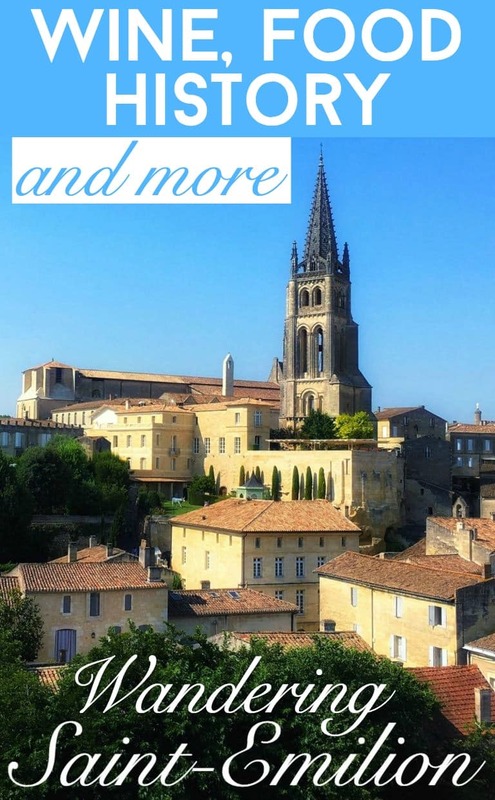 As I touched town in Bordeaux though, and headed for Saint-Emilion – less than an hour from the airport – the landscape soon transformed from built up commercial areas into rolling fields of vineyards, punctuated by rustic chateaux. 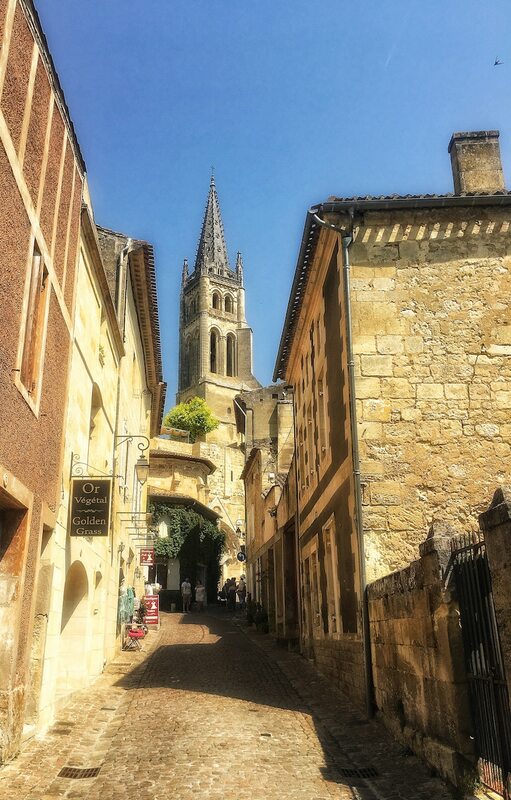 Saint-Emilion was designated a UNESCO World Heritage Site in 1999, and so there are a variety of things to do in Saint-Emilion that can help you immerse yourself in its history, but it’s also small enough that you never feel overwhelmed and unable to relax for fear of missing out on something. And my accommodation – a cottage amid the vineyard-lined countryside at Yelloh! 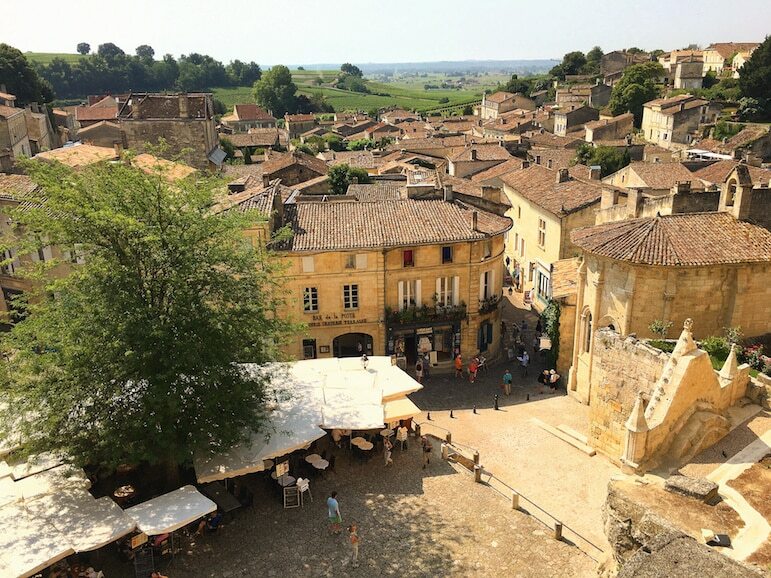 Village Saint-Emilion proved the perfect place to combine sightseeing with relaxation. There I enjoyed the pleasures of the great outdoors with a woodland cottage to languish in. But it wasn’t long before I set out to explore this famed wine region starting with the history and finishing off with a superb glass of locally produced red wine. After taking the resort shuttle to Saint-Emilion I was dropped off at the Collegiate Church in the upper town. This quickly whet my appetite for the glorious architecture in the town. The church was built between the 12th and 18th centuries as a college for canons who maintained the religious life of the town. I’ve always been enamoured with churches due to the hush that descends within their walls, with just the odd echo of footsteps accompanying me down the aisle. But I also love the iconic Renaissance art that often graces the stained glass, walls and ceilings, and a silence that demands your full attention to soak up the magnificent surroundings. 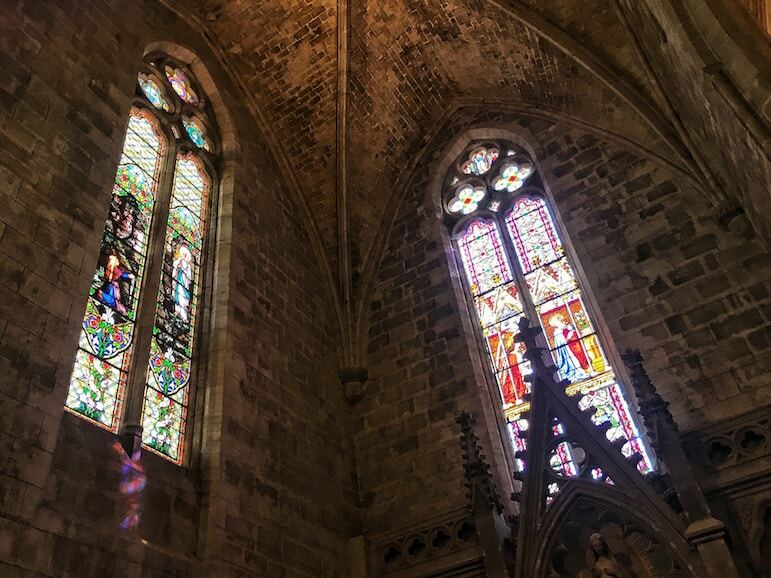 The Collegiate Church was no different, particularly the stained glass to the left of the altar, its electric blues and purples piercing through the darkness and casting a paint palette of reflections on the walls. 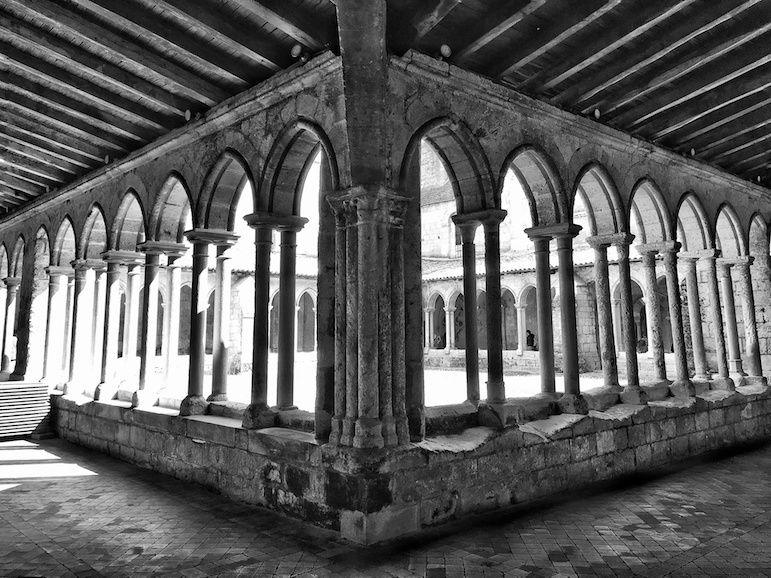 And its cloisters left a similarly vivid imprint in my mind. Walking around the meditation gardens, featuring magnificent arches and art, it almost felt like a spiritual encounter as I pictured the canons from centuries ago wandering through in their robes, prayer books in hand. In this peaceful, reflective place I felt external stresses melting away. Like a box of gems or treasure, sometimes it’s the things that are hidden away that hold the most grandeur and magic. 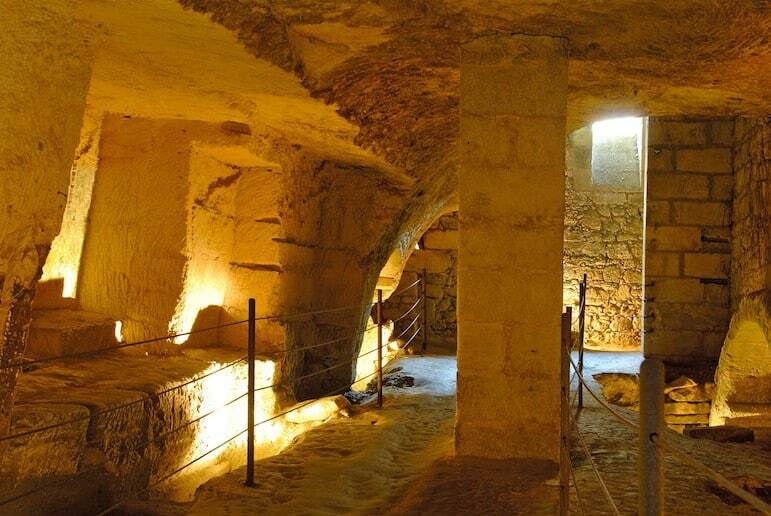 And grandeur was exactly what I unearthed when I joined an underground tour to learn about the fascinating history of the medieval town which lies below ground, plus its links with Emilion, the Breton monk who founded the original village in the 8th century. The tour started just outside the Monolithic Church and Bell Tower. Reportedly Europe’s widest monolithic church, it was carved out of one piece of limestone rock. It’s the same limestone, which graces most of the town with a soft yellow hue which would surely brighten the dullest of days. 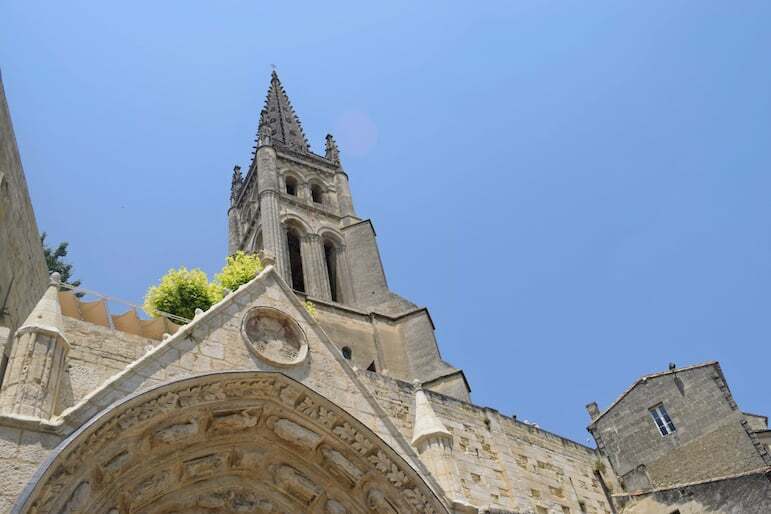 Carved out in the 12th century, the church was constructed to host pilgrims who flocked there to meet Emilion, who it was claimed could perform miracles. The Bell Tower – the highest point in the town – was built between the 12th and 15th centuries, but the weight of the tower – 4,500 tonnes, or the equivalent of 750 elephants – put so much structural pressure on the church, that it had to be reinforced in the 20th century. Inside, the church is deceivingly huge. Nonetheless, the mixture of Romanesque and Gothic styles of architecture make it an interesting focal point for the town, and an important symbol of religion. Though it was closed on the day of my visit, I hear the views of the town from the top of the tower are phenomenal – and the 196 steps are the perfect way to work up an appetite for lunch. 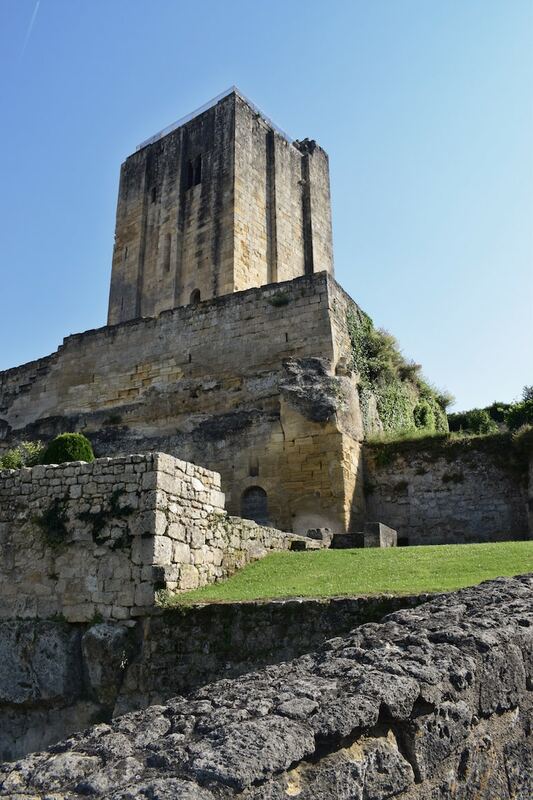 Next up was the Hermitage, the oldest monument in the town and where Saint Emilion lived after he fled Brittany, and the unwanted attention he gained from being able to perform miracles. He decided to dedicate his life to prayer, became a Benedictine monk, and took refuge in the cave which became his home for the last 17 years of his life. 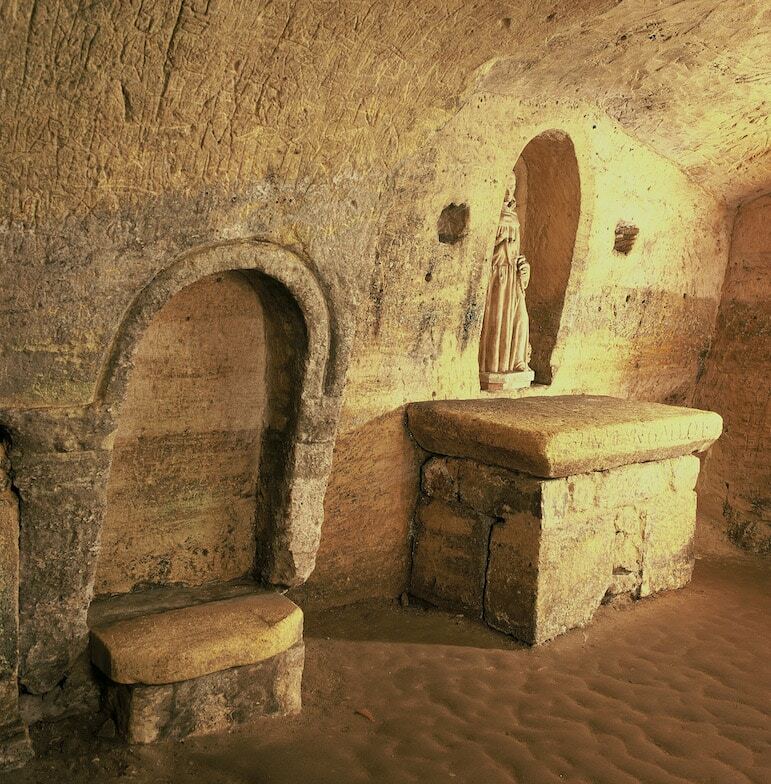 The underground spring was used by the monk to baptise people, with his bed and meditation chair carved out of rock. The latter of which has a reputation as a fertility chair, it is believed that any woman who sits here and prays for a child will fall pregnant within a couple of months. 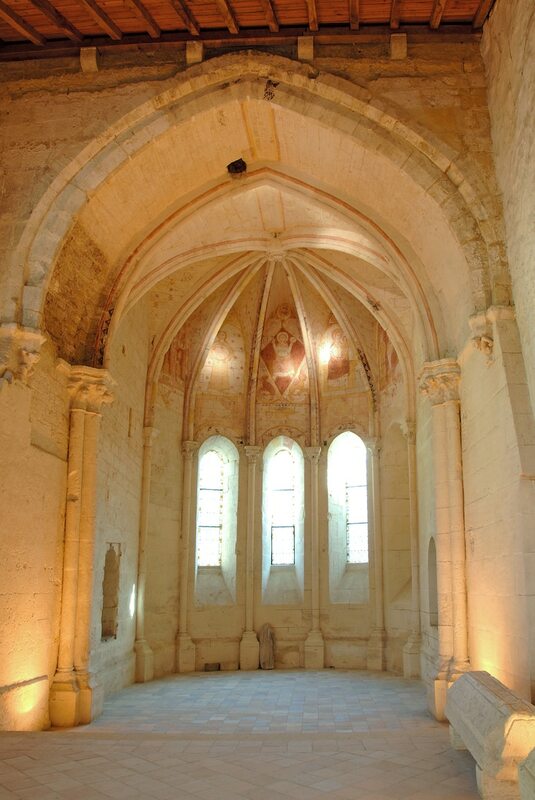 The extremely well-preserved chapel was constructed in the 13th century and dedicated to Emilion, the town’s patron saint. The frescoes above the altar are still visible. After the French Revolution, the chapel was sold to a local wine barrel maker who used the building as his workshop. The soot generated from burning wood to curve the wine barrels, fortunately protected the paintings from sunlight. In 1997, the walls were cleaned, magically revealing these beautifully detailed frescoes. It was at this point during the tour that it sprung to mind the many interesting stories that history has to reveal – if only we look a little closer. 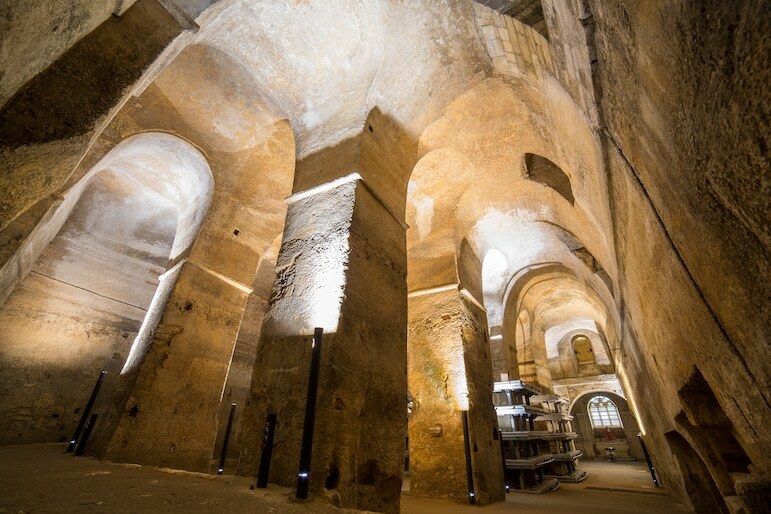 When I first entered the Catacombs, the cool air was initially a welcoming feel. But as I viewed the open grave sites carved out of the limestone rock, including spots which once laid babies to rest, I felt a real chill in the air. Believed to have been built before the church, a cupola which was later carved out of the rock to light the way to heaven, and three men carved around the cupola, symbolise the resurrection. Mystery surrounds this 13th century monument as no-one quite knows why it was built or who ordered its construction. Today it’s the backdrop for the Jurade celebrations on the second Sunday in June and September, when the season’s new wines are assessed for their quality. Climb the 118 steps for an unforgettable reward – views over the town, surrounded by a carpet of deep green vineyards. Although the Bell Tower is the highest point in the town and perfect for capturing those wonderful vistas, the King’s Keep offers fabulous views that include the Bell Tower, so if you have time to get a view of two halves, you should head to the Keep. Visit late in the afternoon to beat the crowds and get the best views. 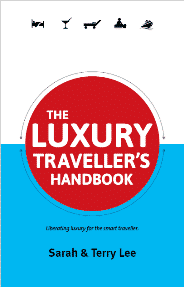 A leisurely lunch and a saunter may not seem too exciting, but as you explore the upper and lower towns, it’s a rather indulgent way to spend a sunny afternoon. 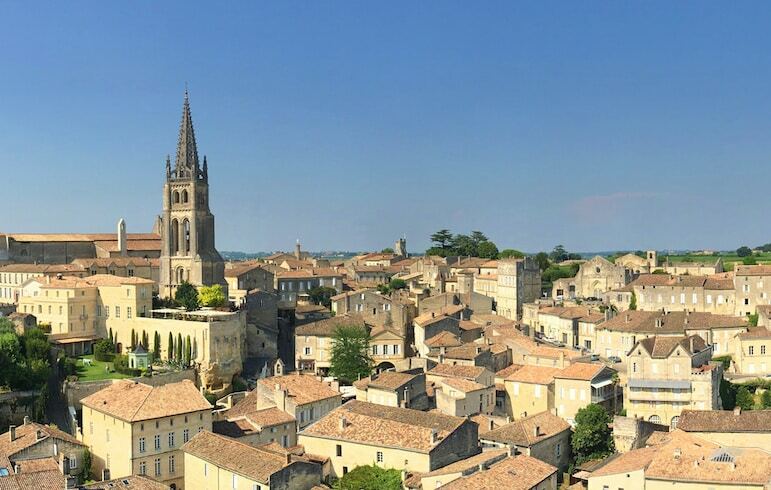 There are numerous, notable vineyards and wine shops to discover in Saint-Emilion. Owing to my short visit and a lack of luggage space, I decided to sample the local wine over a leisurely lunch in the Place du Clocher. 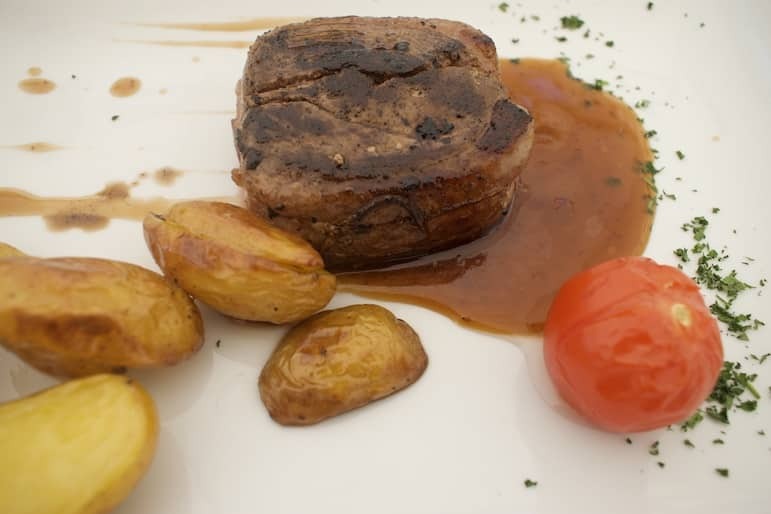 Order from the menu du jour to sample some of the finest foods at a reasonable price. 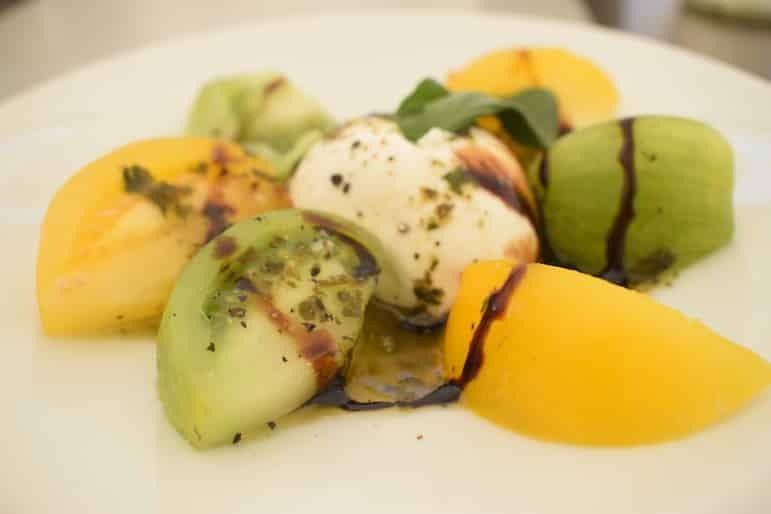 My tomato and mozzarella salad made a thirst-quenching, savoury start at Chez Germaine. Followed by an evenly cooked duck breast and potato it proved the perfect pairing for my glass of 2011 Saint-Emilion Grand Cru, the smooth and rich red bringing out the juicy flavours of the tender meat. Following my hearty lunch, I navigated the cobblestone streets with trepidation (watch out for the steepest and trickiest of them all, Tertre de la Tente), I was overly inquisitive, excited to discover what the labyrinthine paths would reveal next. And my child-like excitement did not leave me disappointed as I entered the bustle of the main square, Place de L’Eglise Monolithe. Ordering a coffee and some divine local macarons, I sat back under the delightful shaded canopy of Amelia Canta, one of the square’s main restaurants. As I made the most of my last few hours in Saint-Emilion, I couldn’t help but wish that every day felt like this. Leisurely afternoons spent dining al fresco, overlooking fabulous backdrops, and relishing in watching the world go by without a care for time.